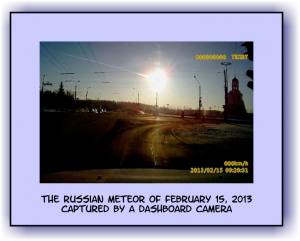 The Russian Academy of Sciences reported that a meteor entered the Earth’s atmosphere on Friday morning travelling at a speed of at least 33,000 mph (54,000 kph) and broke up into various pieces between 18 and 32 miles (30 and 50 kilometres) above the ground. 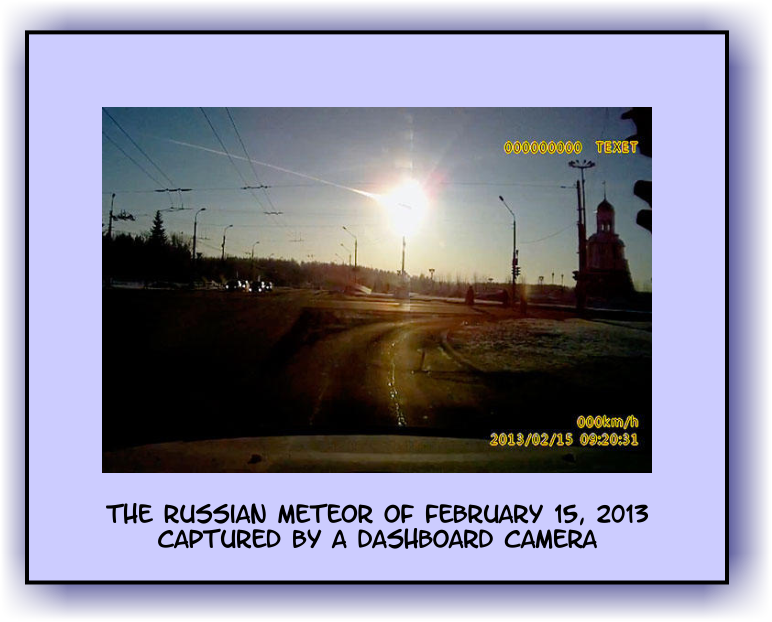 The meteor was seen in the skies over the cities of Chelyabinsk and Sverdlovsk. 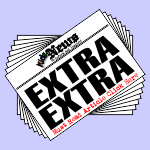 The explosion occurred about 9:20 a.m. local time, as many people were out and about. The event was captured accidently by ordinary people, many of whom have dashboard cameras mounted in their cars (please see videos below). 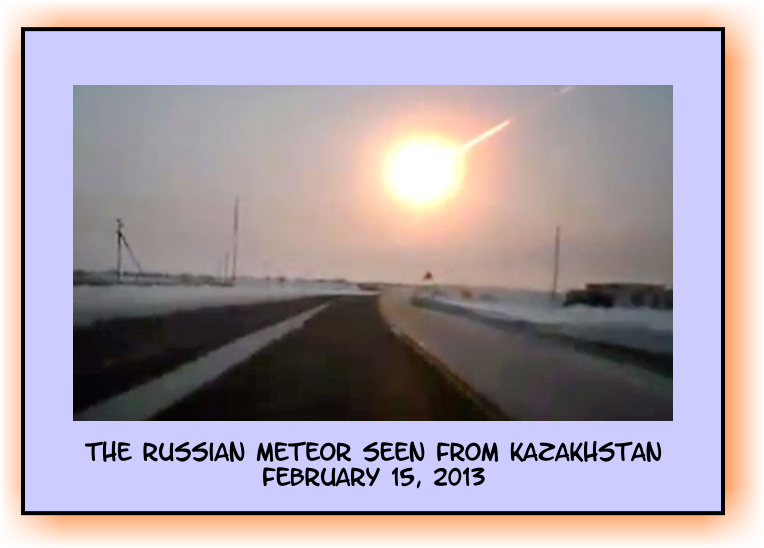 One crater was more than six metres wide (20 feet), while another lump of meteorite was reported to have slammed through the thick ice of a nearby lake. In the town of Chelyabinsk itself, schools and universities were closed and many other staff told to go home early. About 200 children were among the injured. 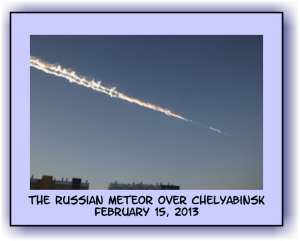 NASA now says the Chelyabinsk object must have been about 55 feet wide (17 meters wide) with a mass of 10,000 tons before it entered Earth’s atmosphere. Early estimates suggested more than 100,000 square metres (over 1 million square feet) of glass had been shattered by the shockwave and 4,000 buildings have been hit. The total cost of the damage in the city was being valued at in excess of 1 billion roubles (33 million dollars). On the other hand, an asteroid, with the catchy name 2012 DA14 came by for a brief visit. It was too small to see with the naked eye even at its closest approach over the Indian Ocean, near Sumatra, Indonesia. The size of the asteroid is about the size of an Olympic swimming pool. The asteroid passed at a distance of 17,500 miles (28,000 kilometres) over the surface of the Earth. In comparison, the satellites that orbit Earth and give us all our TV, cell phone and GPS navigation signals are orbiting at 22,000 miles (35,000 kilometres). That means the asteroid could have hit one of those satellites, but it didn’t, so a big Yay for all of us! 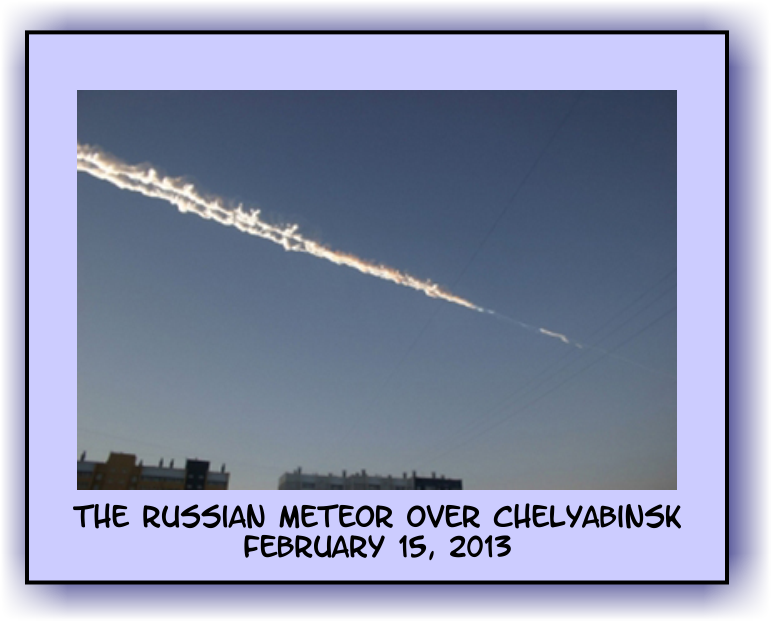 Meteors are rocks from space that have entered Earth’s atmosphere. As they travel through the Earth’s atmosphere they become very hot and bright and seem to streak across the sky, that’s why they are also known as “shooting stars”. A meteor that doesn’t burn up in the atmosphere and hits the Earth’s surface is known as a meteorite. Asteroids are small solar system bodies that orbit the Sun. Made of rock and metal, they can also contain organic compounds. Most asteroids hover in space in an asteroid belt between the planets Mars and Jupiter. 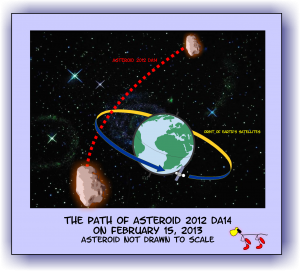 Some asteroids orbit closer to the Sun; we call those “near Earth” asteroids.